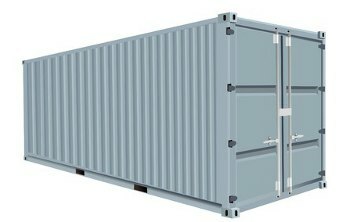 Steel storage containers for reliability and security. 40′ steel storage containers are about the span of two end to end parking spaces.These storage containers are popular for many reasons; not only do they hold two times as much as the 20′ containers, their price per square foot is lower in comparison to the 20′ containers. Storage containers are used frequently at large construction sites, warehouses, car dealerships, contractors, builders, schools and for many other commercial and industrial uses. They’re created of 14 gauge steel providing outstanding protection from vandals, theft as well as the weather. One end of the containers has cargo doors that swing open so it’s vital you keep this in your mind when considering the placement of your 40′ container. The 14 gauge steel doors have industry standard weather tight gaskets and are lockable. All in all, the 40′ storage containers are the preferable option for temporary or long-term storage of valuable equipment and materials. All our 40′ storage containers come with 1 inch thick plywood flooring constructed to handle an enormous amount of weight. This flooring feature allows for ease of accessibility while moving your property in and out of the storage container by foot, forklift or by means of a pallet jack and also adds an extra measure of protection for your property. We will need about 100′ feet of length and 12’ of width to safely back up the truck during drop off and pick up. When we deliver your 40′ storage containers, we request that you have an acceptable area prepared to put the storage container. It needs to be a level surface that’s somewhat smooth and solid. We can set it on grass or dirt, though, a concrete or asphalt surface is favored. Many drivers won’t drive off road, except at a construction site, but should you have a need for delivery to an off road location please let us know in advance. Container height empty 8,200 lbs.